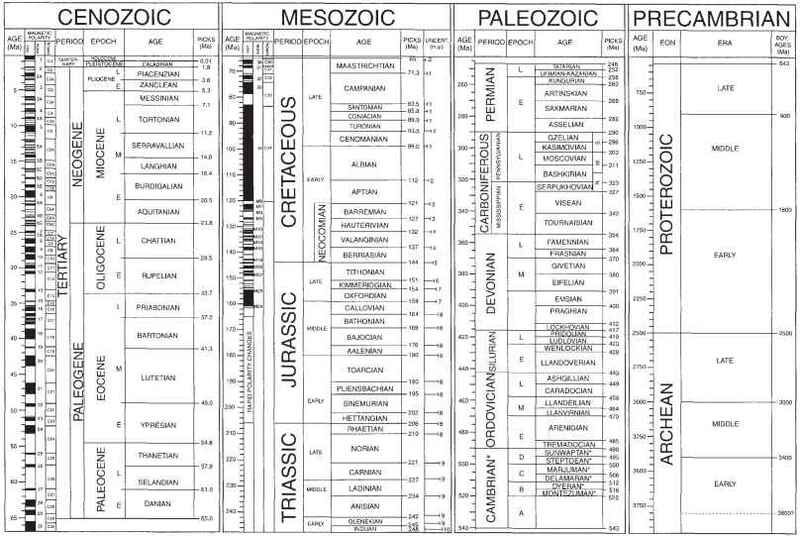 Figure 5.9 Cross-sections of the giant planets (in their equatorial planes). reason for this is that the equations of state of candidate materials, notably hydrogen and helium, are poorly known at the high pressures encountered in the deep interiors. Another difficulty is that the gravitational coefficient J2 (Section 4.1.2) is rather insensitive to the density profile within about a third of the distance from the centre. The other coefficients, J4, J6, etc., penetrate even less far. The interiors of the giant planets undoubtedly consist largely of hydrogen, helium, and icy materials, with rocky materials making up only a small fraction of the mass. The dominance of hydrogen, helium, and icy materials is required by the low mean densities of the giants (Table 4.2), which range from a 'high' of 1640 kg m-3 for Neptune to an astonishing low of 690 kg m-3 for Saturn. These low densities, several times less than typical densities of rocky materials, are even more remarkable given the large size of the giants. □ Why is size relevant? Equation (4.12) shows that large radii lead to large pressures, and large pressures increase the density of a substance. For Jupiter and Saturn the only models that fit their mean densities consist largely of the intrinsically least dense materials - hydrogen and helium. Uranus and Neptune, being smaller, must have icy materials as the main constituent. On the basis of the relative abundances of the elements in the Solar System, water must be the dominant icy material in the giant planets. In the models of Jupiter and Saturn, the outer regions are hydrogen and helium, with small quantities of other substances. 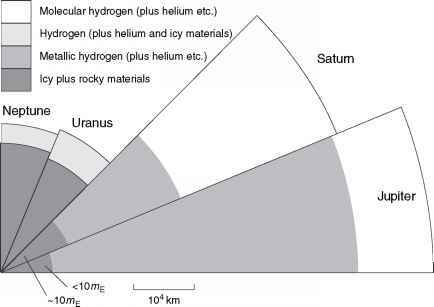 In the case of Uranus and Neptune, even though the outer envelope is mainly hydrogen and helium, there are substantial proportions of icy materials as well. The outermost regions are directly observable, and of course the models match the observations. The compositional layering in the models is strongly indicated by the gravitational data, though the boundaries between certain layers seem to be fuzzy. There is, however, a concentration of icy-rocky materials towards the centres, though perhaps rather weakly in the case of Jupiter. □ Which theory of the origin of the giant planets does this favour? The core-accretion theory predicts that the giants started as kernels of icy-rocky materials that grew massive enough to capture hydrogen-helium envelopes and icy-rocky planetesimals (Section 2.2.5). Some central concentration of icy-rocky materials is thus expected. Table 5.4 lists the temperatures, densities, and pressures at a few depths in the giants -again these are broadly indicative, not definitive. High interior temperatures are indicated by the observed IR excesses from Jupiter, Saturn, and Neptune (Section 4.5.3). The corresponding outward flows of energy from the interiors are given in Table 4.2. For all the giants, hot interiors today are predicted by thermal models. Furthermore, the large magnetic dipole moment of each giant planet indicates extensive, convective fluid regions in the interior that are electrically conducting. Models predict that convection is occurring throughout much of the interior of each giant. The low IR excess from Uranus can be explained by a current lack of convection over some range of depths, perhaps due to a composition gradient. It seems certain that the giants are fluid throughout, in which case hydrostatic behaviour is expected, and the gravitational fields are indeed those expected of rotating hydrostatic bodies. It is clear that the giant planets can be divided into two pairs: Jupiter and Saturn; Uranus and Neptune (Question 4.1, Section 4.1.1). Indeed, some people used to restrict the term 'giant' to Jupiter and Saturn, and call Uranus and Neptune 'subgiants'. We examine each pair in turn. These two giant planets are most like the Sun in their composition, though whereas in the Sun the heavy elements (those other than hydrogen and helium) account for only about 2% of the total mass, in most models of Jupiter these elements account for 5-10% of the mass, and for a roughly three times greater proportion in Saturn. Therefore, the actual mass of the heavy elements is about the same in the two planets.